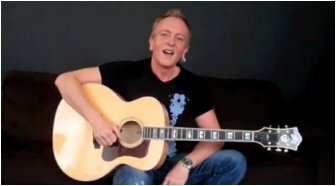 Def Leppard guitarist Phil Collen was recently interviewed by Ultimate Classic Rock in New York and performed a short acoustic set. A video of Phil playing 'Hysteria' acoustically can be viewed below. This was Phil's first performance of his recent New York promo trip. He was also interviewed and spoke about the upcoming tour, Rock Of Ages movie and new music from Def Leppard. "We haven't gotten any dates per say but it's probably going to start around mid May and then going into the summer I think we're going to be touring somewhere else." "I don't think there's much point in doing an album because it's such a quick turnaround, you have a song and then it's gone. For us to do an album, it'd take at least eight months unless we were doing it on tour." "What I think is going to happen - I've already started writing some of the songs - [is that] we release two or three at a time or something like that it's kind of more like an EP or something attached to another project but a full blown album would just take us away for too long and by the rate everything is going by the time we finish the album and we go "okay here it is," there's no more recording industry left. I think you have to be careful with it, we've got some great ideas, I've got this killer song that's totally Def Leppard, it's not totally finished yet but I'm looking forward to getting that on the go as well. I think we'll be doing it in dribs and drabs. I think there will be an album that comes out of something while we've been recording three songs at a time or all at once. That'll be a bit later. I think for the very near future it'd be one or two songs attached to something else."